I for one... take requests. I know some of us are writers, the other is a builder or a decorator. I am ashamed to tell you that I am all three of them. Anyone needing a special lot (a house, a castle, a boat or a space ship) I will be delighted to help you out! I love to set dress and be location manager. I browse the net for all small things on the Sims front, so don't hesitate to ask me if you have any questions! I do also know, most of us just like to build our own stuff... hahahaha. Good to know Fred. If during one of your searches through the web you find the clothes as worn by member of the KukluxKlan (I don't remember how to write it ), tell me so, please. Now I don't really want to write something about the KKK but I'm just interested in the clothes they wore. The same kind of esotheric clothes the spanish wear during the processions in Easter do to penitention. I would like to be able to have framed photo's of Will and Eliza's wedding and some other cutesy stuff! Does anyone know who would be able to do this? Unfortunately I am not as organized as some other simmers when these special moments happen and I forget to have them or other sims ready to take photos, whether it be with their phone or camera. Jenn, you could use the digital picture frames that came with Ambitions. ... ah... but you don't have pictures... maybe you can photoshop (PS) them. (I did it with a screen in one of Barb and my stories, just PS it in an existing frame. If it is only to be for a screen shot or two. You can do the wedding over using a new Will and Eliza... get the pictures and use them to either make a frame in workshop or do the PS thing. How exciting! Well... I will be here if you need me. Not going anywhere! I, too, highly recommend keeping multiple save games with primary story families! I keep a household of my primary family(ies) at every age stage in a half dozen different games, so that I can play them or take screen shots I may have forgotten or need later... most recent example of this was when I had no shot of a wedding kiss/ring exchange for Jono and Dani... of course, he gave me attitude the entire time, since I'd even played that game far enough into their ... ah... issues that their re-exchange of vows was under duress as far as he was concerned... She had no problem with it. She's flirty. lmao. I must say, I am relieved to have seen this thread. I recently re-did my bridge for the next episode for Star Trek Beta.. I made my own panels as a pattern! They look great with the right walls/colours. 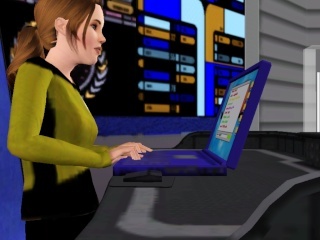 I need some objects made as starfleet panels, and with regards to architecture, I do require some help there, too. Would it be possible to create lower/higher decks on my bridge? You see, I'd like the crewmen to be raised and the Captain to be lower, but the game refuses to let me add foundation decks on the top floor of my ship. Hmph. Well, I see it's point. Basically, I want to raise the floors. oooh, star trek ... I need to read that one! I think I read somewhere that there will be stages coming out with Late Night so you should be able to get the raised crew platform then. In the meantime you could try using stackable OMSPs (MTS2) for screenshots, although that could be cumbersome.